It's All About The Late Game! Now, behold the war torn land, beset by the wrath of wanton Gods filling the air with blood and boasts. This battlefield is stained with hubris. Unwittingly, these foolish warriors have summoned their greatest adversary. Gives great power early game and makes Nemesis more mobile early game to get to camps faster. If Nemesis gets to farm early game and gets ahead of the enemy jungler then she can snowball quite easily and land your team a victory. This item works really well with Nemesis's passive because not only is she taking the enemy god's physical/magical power, but also their physical protections allowing Nemesis to completely annihilate. The item also gives good movement speed. This item is necessary for ANY AA (auto attack) god because it gives good attack speed but has one of the most annoying passives in the game. If your basic attack lands on a target then you have the attacking movement speed debuff removed for one second. This allows Nemesis (even with her ridiculous slows) to keep up with enemy gods. Gives Nemesis wonderful attack speed, some poke damage to enemy gods near lane minions, and helps clear buff camps easier. Gives even more attack speed and takes away enemies physical protections by a percentage. This item does relatively well with Stone Cutting Sword and her passive. This item does well on any auto attack god. With hitting many hits per second and Qin's Sais dealing 4% of the enemies maximum health, this item can tear through anybody. Qin's Sais is almost a core item but because it doesn't give movement speed it can't be. This item gives good flat pen and some attack speed. This item increases Nemesis's survivability with the lifesteal and the passive gaining even more lifesteal. Nemesis can output more damage with items like this or Void Shield. I recommend items like this because Stone Cutting Sword and her passive debuffs the enemy so much that you don't really need heavy defensive items. Nemesis is one of those gods that can go auto attack or ability based. But her core items for this build make her more auto attack based. The cooldowns really don't hurt and the physical protections help quite a bit. This item acts like Shifter's Shield in this situation but takes away a flat portion of an enemies physical protection in an aura. This item allows Nemesis to be semi-tanky while being extremely aggressive. The passive and cooldown allows Nemesis to be up in enemies faces and not be backlashed too hard when getting poked out from Mages, Hunters, and even some Assassins/Warriours. This relic helps Nemesis get out of hard CC moments when her shield isn't up or when her shield isn't enough. Whenever you use your 4-2 combo on an enemy god they'll pop a Curse or Sprint so this helps you catch up to them. Vice versa with Sprint but can help you escape some situations. Nemesis has a really weak early game so this can help you take buffs more easily and you are able to invade early game to take away enemy experience, gold, and potentially a buff. Nemesis dashes in a line, dealing damage to enemies in her path and may dash again within 2s. Using another ability during this time cancels the second dash. This dash (to me) is the best dash in the game. Why? Because you can use it once in one direction and then use it AGAIN IN A WHOLE OTHER DIRECTION! This can lead to easy jukes, escapes, and chases. Nemesis swings her blade, dealing damage in an area in front of her. Enemies in the center of her swing are struck for 2x damage and Slowed for 2s. This is one of Nemesis's most unique skills and attributes to the game. The two second slow goes up all the way to 50% of an enemies movement speed. This skill plus her Ult makes any god extremely slow and almost always a secured kill. 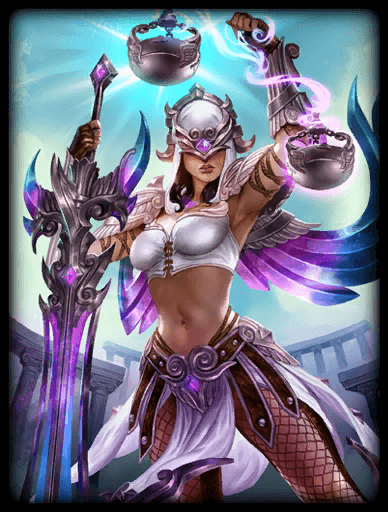 Nemesis activates a temporary Shield around herself that protects her from a set amount of damage, or until time expires. A percentage of incoming damage from gods is healed and reflected back to the source. Hard Crowd Control effects remove the Shield. This shield basically gives 1,000 HP because it goes to 500 shield health base but also heals for 100% of damage done in two seconds to Nemesis. This helps you not get bursted so easily. Nemesis chooses a single enemy god, reducing their Health and movement speed and stealing a portion of their Protections for a time period. Her movement speed is also increased during this time. This item takes 50% protections of an enemy god at any level of the ult. When fully leveled you can take 50% of a targets current HP. This also slows down enemies and quickens you, if you use your Slice and Dice upon the enemy god who was ulted you can slow the enemy by 75%! You also gain a portion of protections stolen from the enemy god. Going on strong with my fourth guide out now! Hope you enjoy the build and information. Zilby's "A Template For Guides"
Technotoad64 Also helped me out ALOT on this guide. They have a really good, furbished guide for Zhong Qui, Zhong Kui: It's in the bag!, I highly recommend you go check out their guide if you like the layout/coding of this guide. The guide is well written and informing, yet still very "punny". Don't forget to upvote the guide if you like it!